Although there have been plenty of news articles describing the proposed 4000 satellite constellation that SpaceX filed with the FCC last week, to date there has been no analysis of how technically plausible this proposal actually is. That is perhaps unsurprising because the Technical and Legal Narratives included with the submission omit or obscure many of the most salient points needed to analyze the system and determine how realistic the claims made in SpaceX’s Legal Narrative actually are. Low cost: SpaceX is designing the overall system from the ground up with cost effectiveness and reliability in mind, from the design and manufacturing of the space and ground-based elements, to the launch and deployment of the system using SpaceX launch services, development of the user terminals, and end-user subscription rates. What is particularly interesting is that the application says nothing whatsoever about the size of the user terminal that will be needed for the system. One hint that the user terminals are likely to be large and expensive is that SpaceX assures the FCC that “[t]he earth stations used to communicate with the SpaceX System will operate with aperture sizes that enable narrow, highly-directional beams with strong sidelobe suppression”. More importantly, by analyzing the information on the satellite beams given at the end of the Schedule S, it is clear that the supposed user downlink capacity of 17-23Gbps per satellite assumes a very large user terminal antenna diameter, because there are only 8 Ku-band user downlink beams of 250MHz each per satellite, and thus a total of only 2GHz of user downlink spectrum per satellite. In other words this calculation implies a link efficiency of somewhere between 8.5 and 11.5bps/Hz. For comparison, OneWeb has 4GHz of user downlink spectrum per satellite, and is estimated to achieve a forward link efficiency of 0.55bps/Hz with a 30cm antenna and up to 2.73bps/Hz with a 70cm antenna. Put another way, OneWeb is intending to operate with twice as much forward bandwidth as SpaceX but with only half as much forward capacity per satellite. That’s because OneWeb is intending to serve small, low cost (and therefore less efficient) terminals suitable for cellular backhaul in developing countries, or for internet access from homes and small businesses in rural areas. In contrast SpaceX’s system appears much more focused on large expensive terminals, similar to those used by O3b, which can cost $100K or more, and are used to connect large cruise ships or even an entire Pacific Island to the internet with hundreds of Mbps of capacity. While this has proved to be a good market for O3b, it is far from clear that this market could generate enough revenue to pay for a $10B SpaceX system. Even then, an assumption that SpaceX could achieve an average downlink efficiency of 10bps/Hz seems rather unrealistic. SpaceX is able to gain some increased efficiency compared to OneWeb by using tightly focused steered gateway and user beams, which the Technical Narrative indicates will provide service in “a hexagonal cell with a diameter of 45 km” (Technical Annex 1-13). But there are only 8 user downlink beams per satellite, and so the total coverage area for each satellite is extremely limited. A 45km diameter hexagon has an area of 1315 sq km (or 1590 sq km for a 45km circle). Taking the more generous measure of 1590 sq km, over 5000 cells would be needed to cover the 8 million sq km area of the continental US. And SpaceX states (Technical Annex 2-7) that even in a fully deployed constellation, 340 satellites would be visible at an elevation angle of at least 40 degrees. So this implies that even when the constellation is fully deployed, only about half the land area of CONUS will be able to be served simultaneously. And in the initial deployment of 1600 satellites, potentially only about 30% of CONUS will have simultaneous service. SpaceX could use beamhopping technology, similar to that planned by ViaSat for ViaSat-2 and ViaSat-3, to move the beams from one cell to another within a fraction of a second, but this is not mentioned anywhere in the application, and would be made even more challenging, especially within the constraints of a relatively small satellite, by the need for avoidance of interference events with both GEO and other LEO constellations. In summary, returning to the objectives outlined above, the claim of “high capacity” per satellite seems excessive in the absence of large, expensive terminals, while the “worldwide coverage” objective is subject to some question. 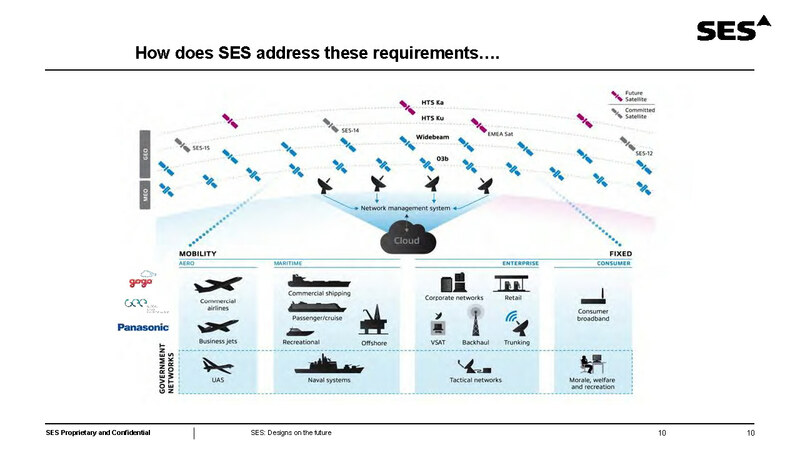 Most importantly, it will likely be particularly challenging to realize the “low cost” and “ease of use” objectives for the user terminals, if the phased array antennas are very large. And the system itself won’t be particularly low cost, given that each satellite is expected to have a mass of 386kg: taking the Falcon Heavy launch capacity of 54,400kg to LEO and cost of $90M, it would take at least 32 Falcon Heavy launches (and perhaps far more given the challenge of fitting 140 satellites on each rocket), costing $2.8B or more, just to launch the 4425 satellites. This continues SpaceX’s prior efforts to cause problems for OneWeb, because OneWeb provides continuous wide area coverage, rather than highly directional service to specified locations, and therefore (at least in the US, since it is unclear that the FCC’s rules could be enforced elsewhere) OneWeb may be forced to discontinue using part of the spectrum band (and thereby lose half of its capacity) during in-line events. OneWeb is reported to be continuing to make progress in securing investors for its system, and it would be unsurprising if Elon Musk continues to bear a grudge against a space industry rival. But given the design issues outlined above, and the many other more pressing problems that SpaceX faces in catching up with its current backlog of satellite launches, it is rather more doubtful whether SpaceX really has a system design and business plan that would support a multi-billion dollar investment in a new satellite constellation.